Unique Gated 4 bedroom Spanish Hacienda with incredible features you won't expect to see! Gated entry courtyard with koi pond, Dramatic living room with beam ceilings & fireplace. Library/Study, Formal dining room overlooks courtyard. Huge chefs kitchen, family room with wall of windows. Large master bedroom with sitting area. Private pool. Incredible large scale covered pavilion with drop down movie screen/projector. Imported tiles and doors. Elevator serves 3 levels. Expansive lower level garage for 3 or more cars, workshop and hobby areas, storage rooms and more. Street to Street lot, great views and site. Lot Size: 0.15 Acres / 6484 Sq. Ft.
SchoolsClick map icons below to view information for schools near 1675 Angelus Avenue Los Angeles, CA 90026. Listing provided courtesy of Brett Lawyer, Hilton & Hyland. Home for sale at 1675 Angelus Avenue Los Angeles, CA 90026. 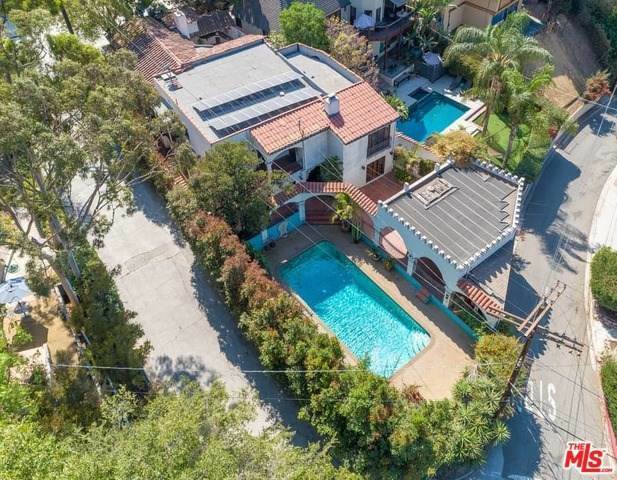 Description: The home at 1675 Angelus Avenue Los Angeles, CA 90026 with the MLS Number 18396328 is currently listed at $1,555,000 and has been on the Los Angeles market for 188 days. You are viewing the MLS property details of the home for sale at 1675 Angelus Avenue Los Angeles, CA 90026, which includes 4 bedrooms, 5 bathrooms and has approximately 3560 sq.ft. of living area.